Calendula (a.k.a. Marigold) is a lovely flower with lovely healing potential. The plant’s flowers, and its leaves, have a few different healing properties that remedy different ailments. It is easy to grow this medicinal flower plant at home. Calendula, or Marigold, will grow in almost any soil, in flower pots and window boxes. They would love to be part of the garden, so if you’ve got a backyard, add some calendula for a burst of sunshine as well for its excellent medicinal properties. Calendula grow in semi-shade to full sun, so it may grow just about anywhere. With a long history of wound-healing properties and skin-soothing treatments, it’s no wonder why this flower is an easy favorite. Calendula has anti-inflammatory and antimicrobial properties, most often used to heal cuts and infections. 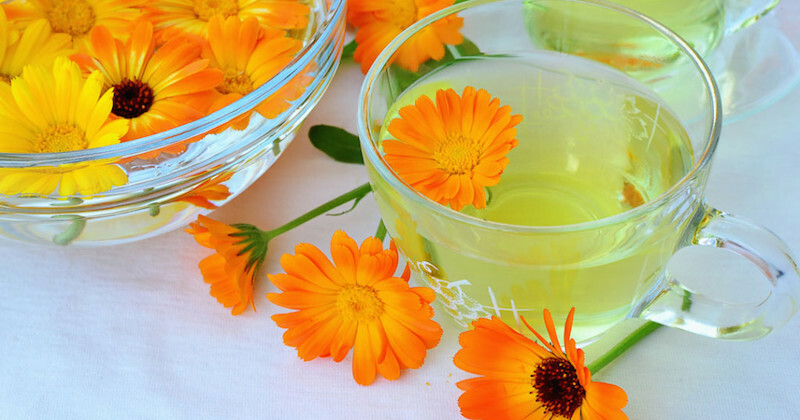 Calendula teas offer relief for inflamed or infected mucus membranes. Using the tea as a mouthwash, it helps clean out gum and tooth infections. Gargling the tea helps remedy sore throats and even tonsillitis, and when drank, the tea treats bladder infections and stomach ulcers. Reach for calendula ointments to clear up all sorts of skin issues. From fighting cold sores to cleaning up cuts, calendula ointment has a wide range of problems to tackle and it tackles them. In fact, there is a wide range of calendula products. From teas and ointments, to oils, salves, soaps and lotions there are multiple ways to use calendula. You can often buy bulk dried flowers, tinctures and succus, a concoction made from fresh juice from the leaves and young flowers of the plant. Making calendula tea is simple. You’ll need dried flowers, so either prepare these from your own calendula plant, or procure them from the local health store. For every cup of hot water you use, add 1 heaping spoonful of the dried flower. Drink 2 to 4 cups a day for therapeutic use, or you can even use the tea topically with a dry, clean towel. Simply soak with the tea and rub the infected area. There are rarely any side effects reported when using calendula medicinally. Pregnant or breastfeeding women should not drink calendula tea but otherwise it is safe. Calendula is easily available, you’ve probably just never been looking for it before. It’s been around for centuries! Greeks and Romans used dyes from this vibrant yellow flower in ceremonies and procedures. Calendula flowers are sacred flowers in India, where the petals have been used since ancient times to decorate statues of deities. If I had a garden, I would plant these lovely flowers. Of course they have many medicinal purposes, they will definitely also brighten up the day by just blooming in the garden.